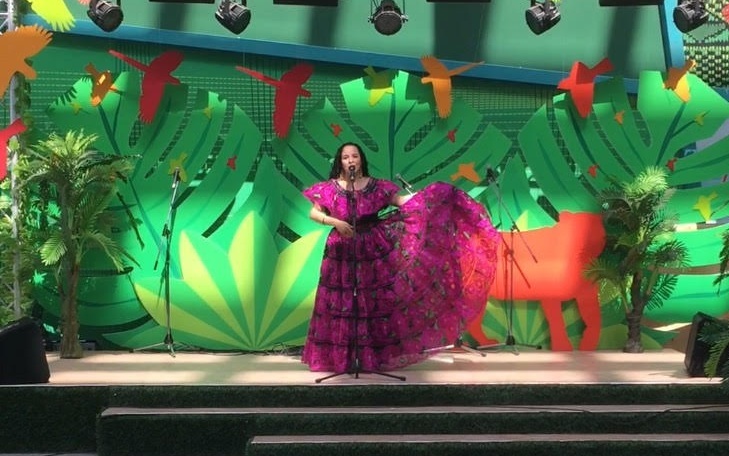 Each day, the Latin American Plaza holds concerts showcasing the cultures and traditions of its member countries. As I walked past this morning, I saw a woman standing alone on the stage, preparing to sing to what was then an empty atrium. I almost continued walking by, but then I heard her sing a song I’d never expected to hear in Astana, Kazakhstan: Cielito Lindo. The singer was from Mexico, just like my grandfather was, and the song she was singing was close to my heart. I was in high school when I first heard Cielito Lindo and memorized it’s beautiful verses. When my mother found out, she noted how much it would mean to my grandfather if I were to sing it for him. I never did. Speaking, let alone singing, to my grandfather in Spanish was something that was very difficult for me to do. I was scared of speaking incorrectly, of not understanding him, of not living up to his expectations. It was in part this fear of speaking foreign languages that made me want to work at EXPO; I would beat it by speaking another language every day. Cielito Lindo, los corazones Cielito Lindo, to our hearts. She came up to me after the concert to tell me I was the first person she’d ever seen sing along with her. I wish I could tell my grandfather what she said. I think it would have made him proud.